Transform your life ... like me! Read more about me & View My Books in English, Spanish, Russian & Chinese. Here you are, on the internet, barely able to sit in front of the screen, perhaps crying, looking for help. ThreeHour management plan will protect kidneys, bring comfort and make you think what else to do. Angela Kilmartin was born in Brentwood, Essex, UK, 1941 as Angela Mendham. She attended the Ursuline Convent. Cystitis! Its hell! Prevent it! 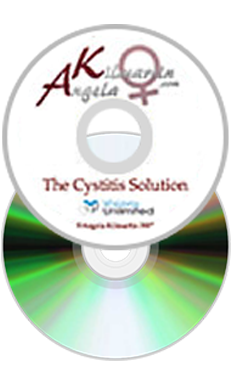 Do you want cystitis, bladder, urinary tract infections to wreck your love life? ; STOP them! Prevent this hell! Yeast and candida infections can do just the same. Cystitis, bladder infections, urinary tract or water infections will only stop when you the patient understands what is causing them. Only then can you start preventing them. Here you are, on the internet, barely able to sit in front of the screen, perhaps crying, looking for help. I am telling you -until you find the cause or causes of bladder or water infection, you may get another one. You are now on the right website to learn about prevention and causes and what to do NOW this minute! My famous ThreeHour management plan will protect kidneys, bring comfort and make you think what else to do. Simple prevention, instead of just buying costly temporary relief products like D-Mannose or Cranberry is the ONLY way to go. Products including antibiotics never cure long-term because bladder, urinary or water infections/I.C. / Cystitis; Candida, Yeast Infection and Vaginal Thrush are mainly all self caused and are therefore curable by you! Be assured that I can help you prevent bladder, urinary and water infections! You can now get well! You will be amazed at all my knowledge. I am the original Campaigner and Researcher in my fields. You can now get well!